If you’ve watched the TV show “The Office” as religiously as I have, the classic “stapler in Jell-O” trick surely sounds familiar. It’s pretty much what the name describes: Simply make a batch of Jell-O, but make sure your colleague’s stapler is hidden inside the mold. It’s a classic prank. 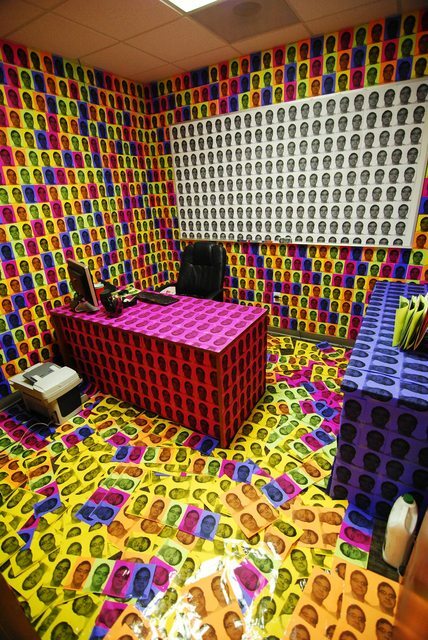 But what other, less conventional pranks are out there to add some kicks to an otherwise average day at the office? 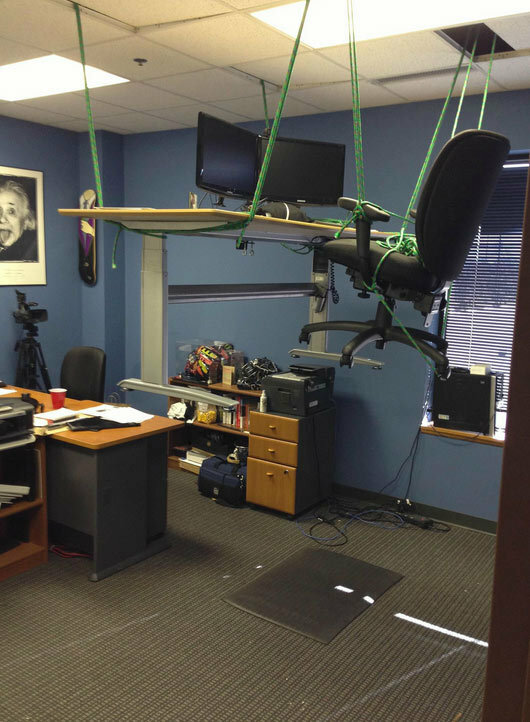 We asked our friends and combed the internet for more examples of some of the funniest office pranks, and pulled together this list to serve as inspiration for your own work pranks. 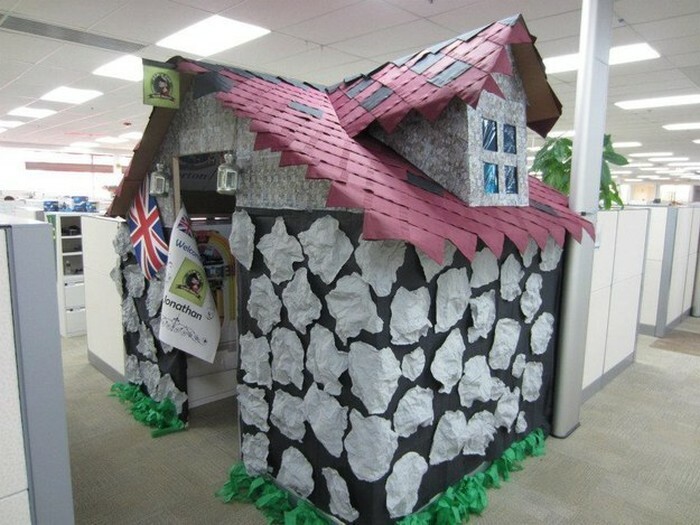 Every company has a story about that funny office prank of yore. 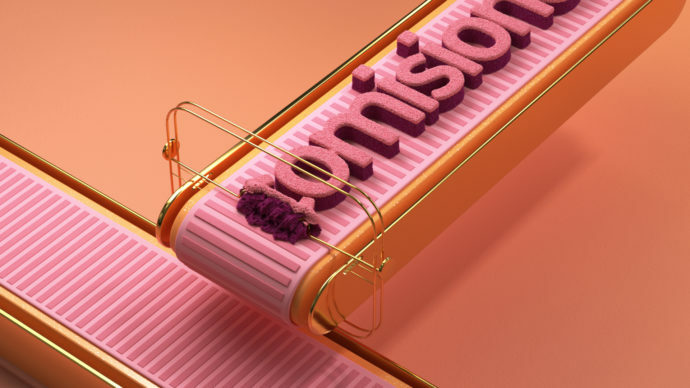 Whether you’re doing some early April Fool’s Day research, or just feeling a little tricksy, it’s time to get a prank of your own in the books. Here are some ideas. Speaking of Halloween, here’s what nightmares are truly made of. Nicolas Cage is easy to come by in the meme community these days. Print a picture of him at his most, well, enthusiastic — and allow him to greet everyone who takes a bathroom break. 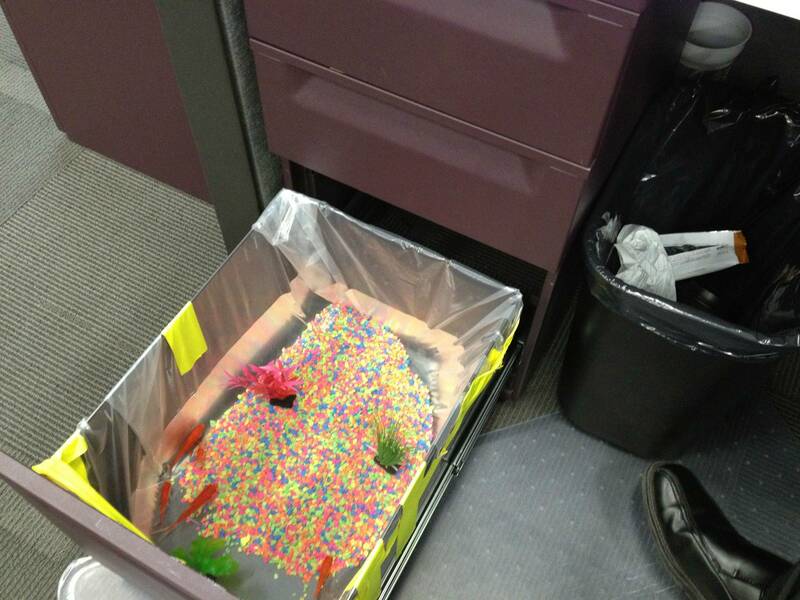 There’s something fishy about this office prank … Just be sure to include fish food; experts suggest you should feed this prank twice a day. Usually, when you see feet underneath the stall, you just have to wait your turn. In this case, you might be waiting forever. 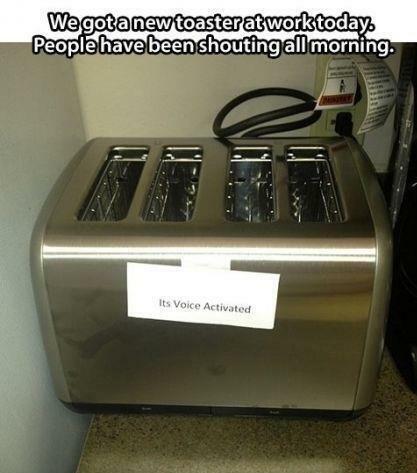 Set this guy up in your office bathroom and see how long it takes for people to start talking. We just hope nobody called the paramedics on this poor, empty suit. Tighten the zip-tie, throw it, and run for your life. Or, leave it in your coworker’s office when they’re on break. They’re sure to return to a potent workspace. This is the perfect use for those sticky notes that keep piling up — especially if they’re all for someone who just won’t finish his or her tasks. 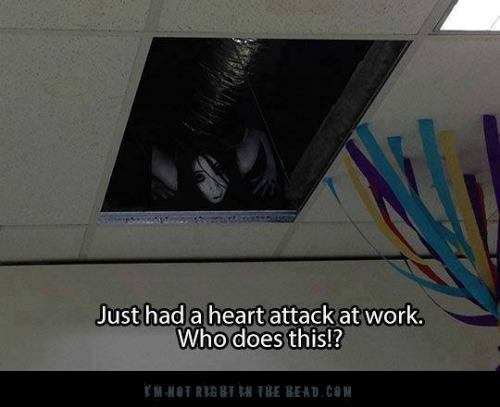 The prank below is a wonderful way to remind them before they take off for the day. Never ask your work buddy to unlock your iPhone for you, or they’ll make you look like the worst speller of all time when you go to type a text or email. 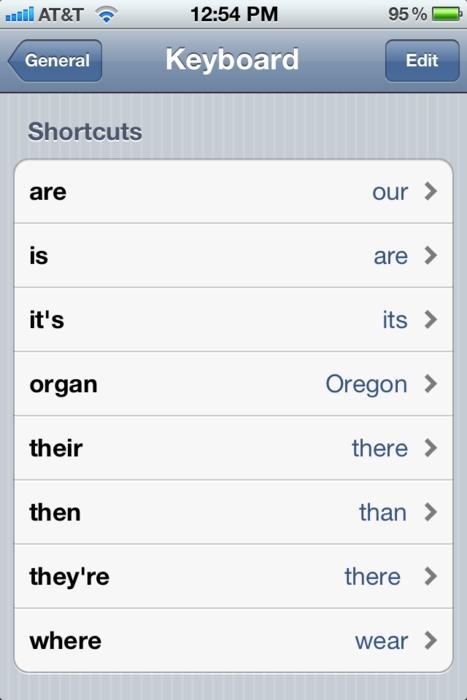 Settings > General > Keyboard > Add new shortcut will make this prank a reality against your most detail-oriented colleague. 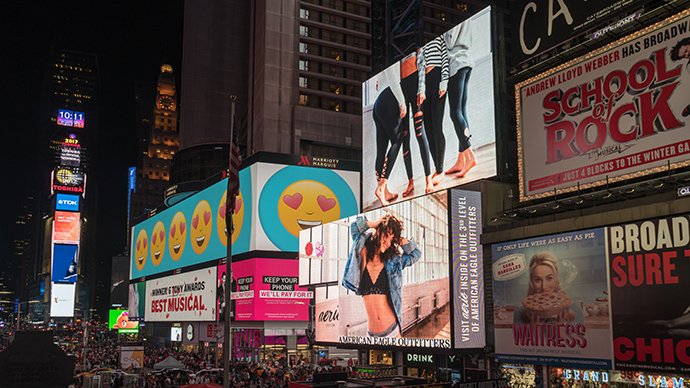 Haven’t you ever wanted to get a room’s attention the second you walk through the door? Well, the prank below will even get the person entering to stand up straight. This is certainly one way to make sure everyone’s alert before a meeting. Hey, at least it’s not glitter? 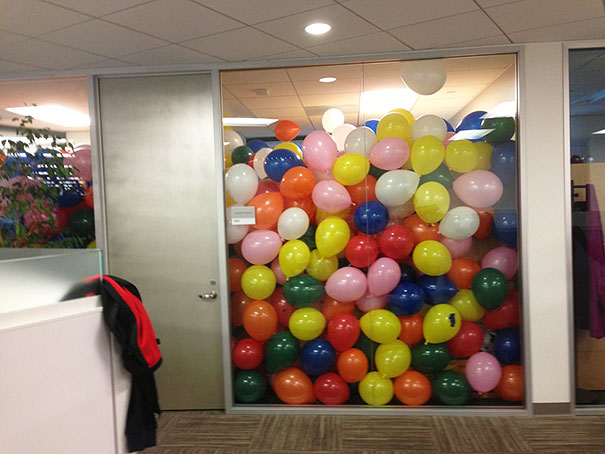 This prank works two ways: You can either surprise the next team who reserves this room, or have a day-long meeting in here without anyone knowing your business. You will of course have some static electricity when you exit the room. For trolls, by trolls. Luckily, you can buy many of these trolls in bulk. 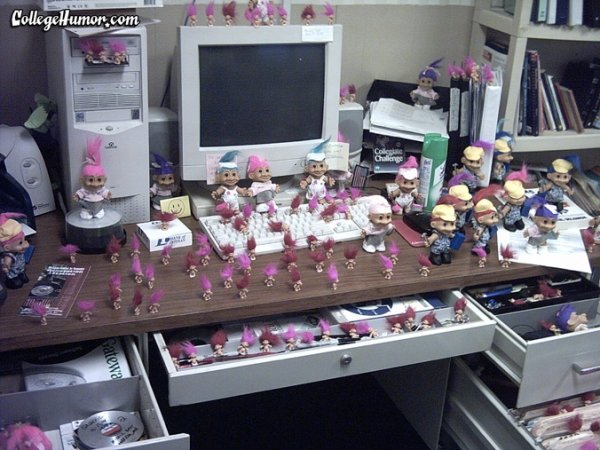 Click here if you’re serious about trolling your coworker’s workstation — just keep in mind you will have to buy more than one pack of trolls to make this stunt worth it. Oh look, a budget trip to the beach. 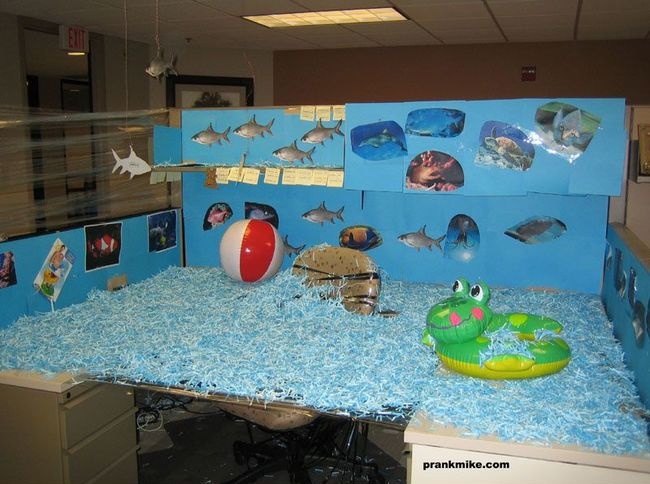 This prank gives a whole new meeting to the term, “staycation.” Surprise your coworker when he/she comes back from a beach getaway with, well, another beach getaway. The downside is it’ll be nothing like where they were. The upside is they won’t need a towel. Hey everyone, there’s cake up for grabs in the kitchen! 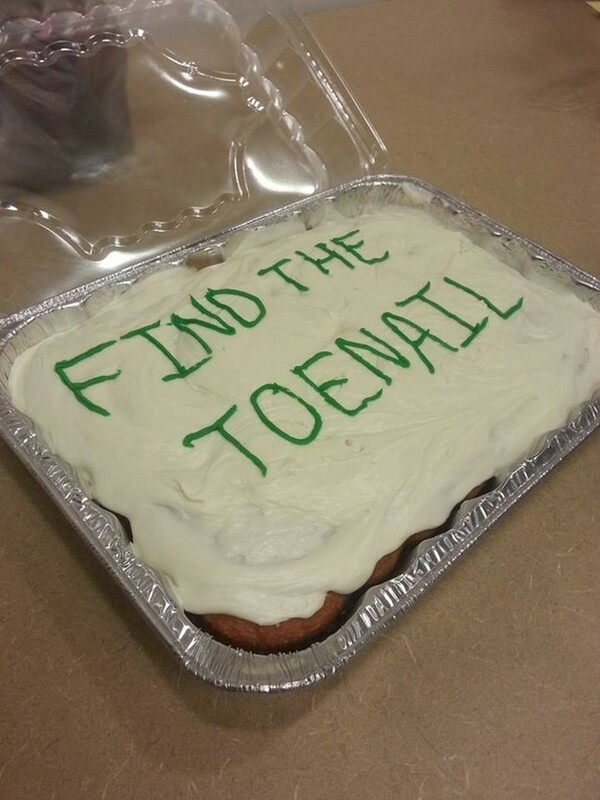 The prank, however, is written in frosting. This is a good gesture to someone who loves the expression, “needle in a haystack.” Happy hunting. “I don’t know, I feel like my boss is always watching me,” your coworker might say. 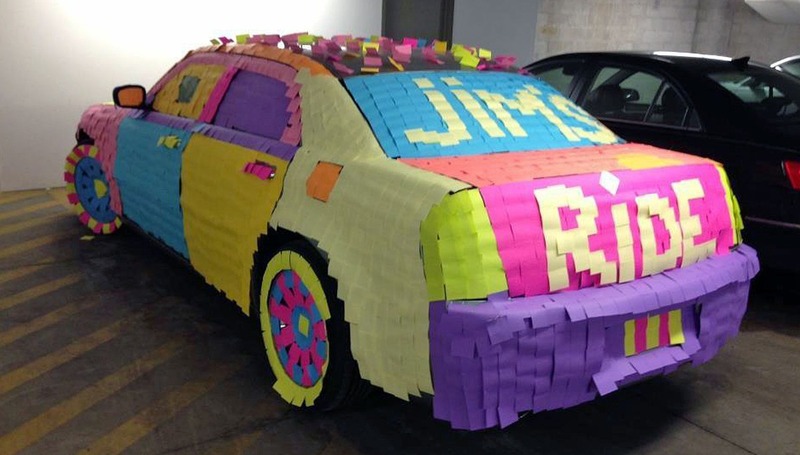 Change their perception of micromanagement when this colorful prank. Suddenly a “quick checkin” doesn’t seem all that bad. Simple, yet brilliant. Change the terms of breakfast ever so slightly, and the kitchen becomes the most confusing room in the office. This little note pranks the entire office — a true masterpiece of prank-dom. As Ron Burgundy from Anchorman says, “I’m not even mad. I’m just impressed.” Help your coworker who loves taking his/her work home, take their home to work instead. 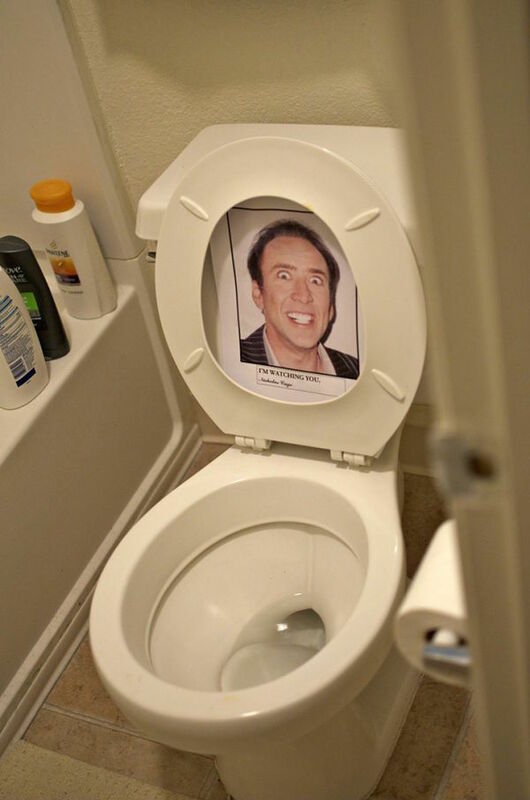 As you can tell, you might need to stay late the night before to get this prank just right. 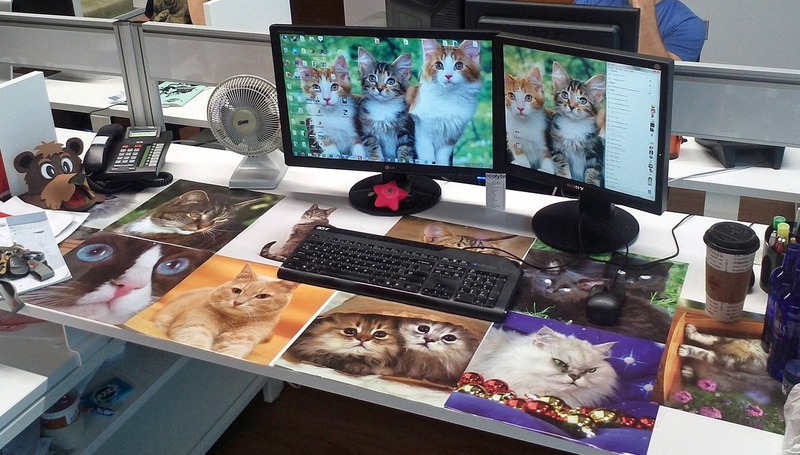 This could actually make your cat-loving coworker’s day. Or, it could make for the greatest prank of all time against the coworker who’s violently allergic to cats (that is, as long as they’re not allergic to photos of cats, too). 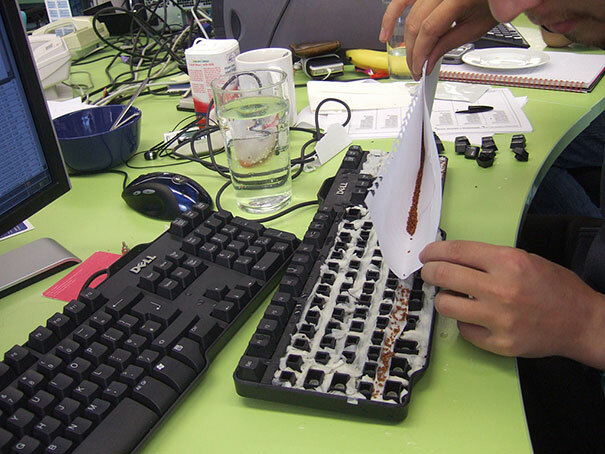 Work with your IT department to fertilize this prank perfectly. 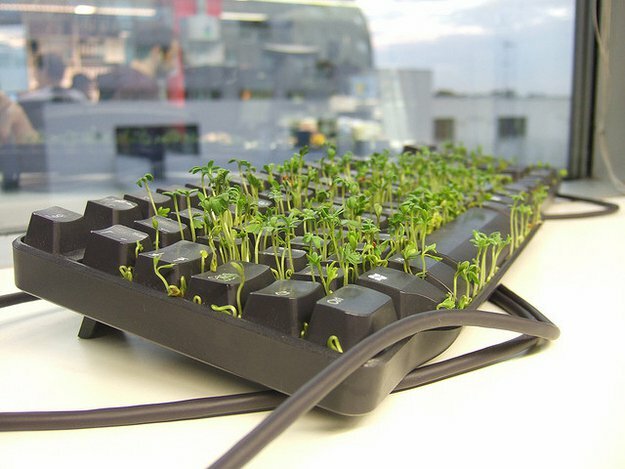 Soon enough, its user will wonder why their keyboard is growing. 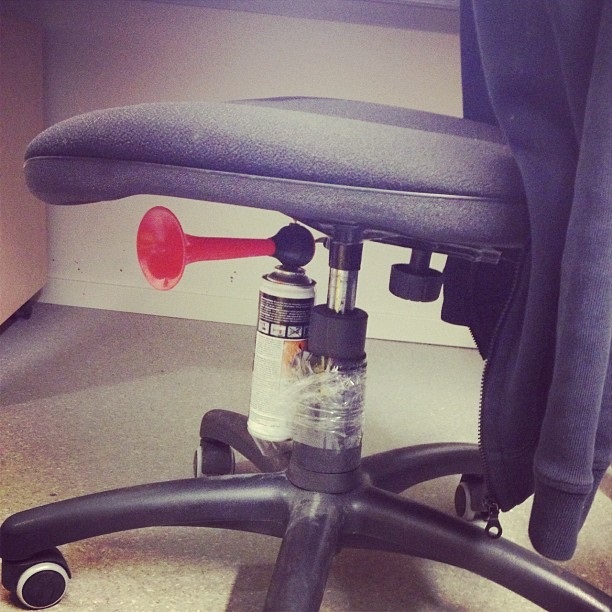 We suggest targeting someone who sits close to the window — some pranks just need some sunlight. “You said you wanted to spend more time with nature,” you might say in your defense. 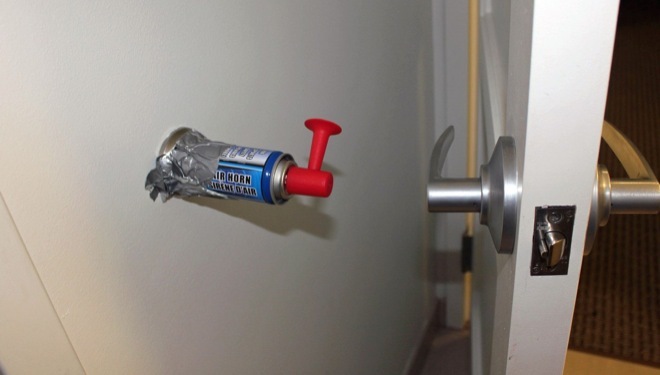 Similar to the Entrance Foghorn (prank #8, above), this prank will probably scare more than just the person who sits down. Of course, it’ll be a lesson to anyone who, I suppose, tries to sit too low at their desk. For the man who never has enough time. 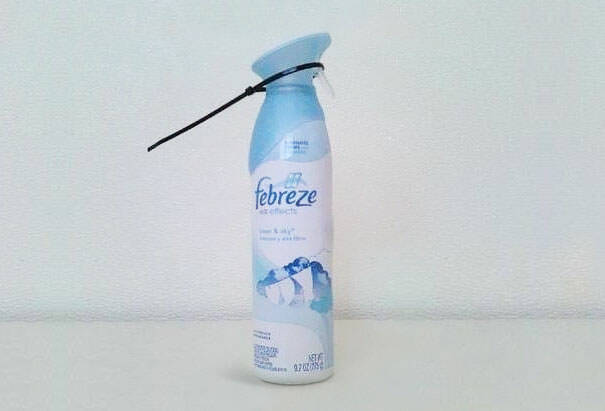 Or, for the coworker who takes way too many bathroom breaks during the day. Prank them with their very own throne the next time nature calls. 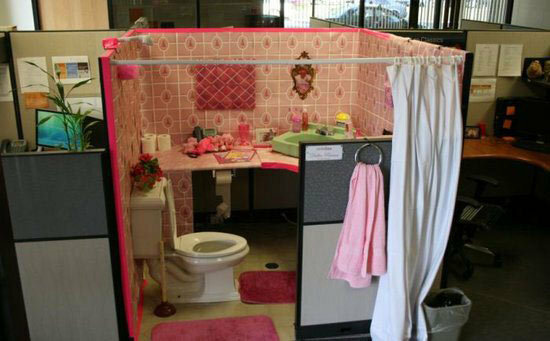 … Or anyone, really, who never has enough time to make a pit stop — especially if they have specific bathroom decor preferences. About that whole, “At least it’s not glitter” thing in prank #9? Well, this prank can’t make that promise. For the coworkers who don’t yet know the permanence of getting glitter on yourself, this prank is sure to set them straight. Sometimes, you’re not sure how to ask for another day off. For those days where you simply can’t come into work, but don’t have the heart to call out again, the doll who looks just like you is the perfect substitute. Or, just put ‘em at your colleague’s desk and give them a much-needed identity crisis. When you finally learn about your colleague’s celebrity crush, make sure they know how much you care. When words just aren’t enough to express your sentiment, give your manager the perfect way to say “thank you” every time they go to take a sip of coffee. “Hey chief, I found a spider on your desk, but don’t worry, it’s been handled.” This prank doesn’t have to have an actual spider in it — the mystery, alone, is all you need to prank your employee. And finally, for the boss who has everything, it’s the gift that keeps on giving. Want more? 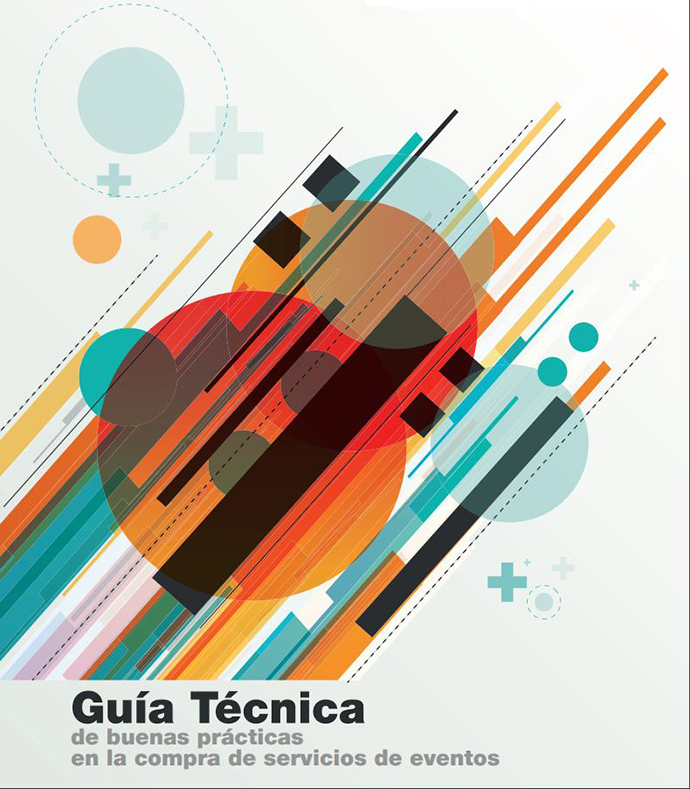 Read The HubSpot Culture Code: Creating a Company We Love.